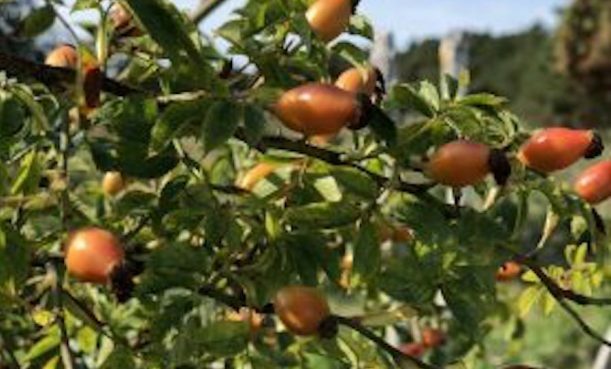 Rose hips, also known as rose haws or rose heps, are the fruits of the rose plant, and begin to form after the flowers are pollinated in spring or early summer, ripening in late summer through autumn. Rose hips are packed with the vitamins C, D and E, calcium and are full of antioxidants. In Sweden this abundant, vitamin-rich food resource is utilized to create one of the country’s most celebrated desserts, Nyponsoppa, rose hip soup. Cut each rose hip in half then scoop out all of the seeds and hairy bits. Keep the skins and compost the rest. Combine the skins and water in a medium saucepan, bring to a boil, and simmer for about 30 minutes until rose hips are softened. Increase the heat and gently boil for 15 minutes to reduce the liquid. Strain the liquid through a sieve, pressing as much pulp through the sieve as possible. Pour this liquid back into the saucepan, and heat over medium. Add the honey, vanilla, and arrowroot mixture and cook for 5 minutes more. Pour into bowls, and serve warm or cold, garnished with crème fraiche, yogurt, or whipped cream. Small rose hips are tedious to work with so look for the largest rose hips that you can. Rose hip hairs are itchy, so best to use a small spoon to scoop out the seeds and hairs. While fresh rose hips are great when available, the dried version is perfectly fine for this soup. If using, soak the dried rose hips in cold water overnight. Try adding a tablespoon of fresh orange juice and some grated orange zest to each dish of soup. This entry was posted in Eat Good Food and tagged rosehip, soup, Sweden.